January is suppose to be out with the old and in with the new....right? I am so tempted by "new" projects being shown on IG and blogs, but I am determined to finish some of my older UFOs. I have told myself that I can start something new AFTER I finish two old ones. I don't even want to count how many UFOs are hiding here. 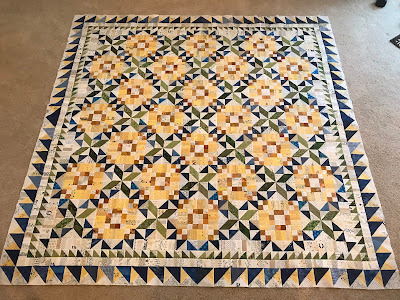 That being said, I did participate in the yearly Mystery Quilt at Quiltville.com. I changed mine up color wise. Once I finished it, I decided to make it a bit bigger by adding a paper pieced strip border to it. What's fifty two more paper pieced strip blocks anyway? It now measures 84" square which will make a nice sized quilt. I can honestly say that not one new fabric was purchased for this quilt. YEAH. I just don't understand why the stash does not appear to have gone down any. Now for the "old" project. I have had a stack of Scrappy Mountain blocks sitting on my ironing area F-O-R-E-V-E-R! I refused to remove them for fear they would end up in the dark spot. I played around with a few layouts and decided on the second, but the first one intrigued me too. Several years ago Lori Holt had a Bloom Sewalong. 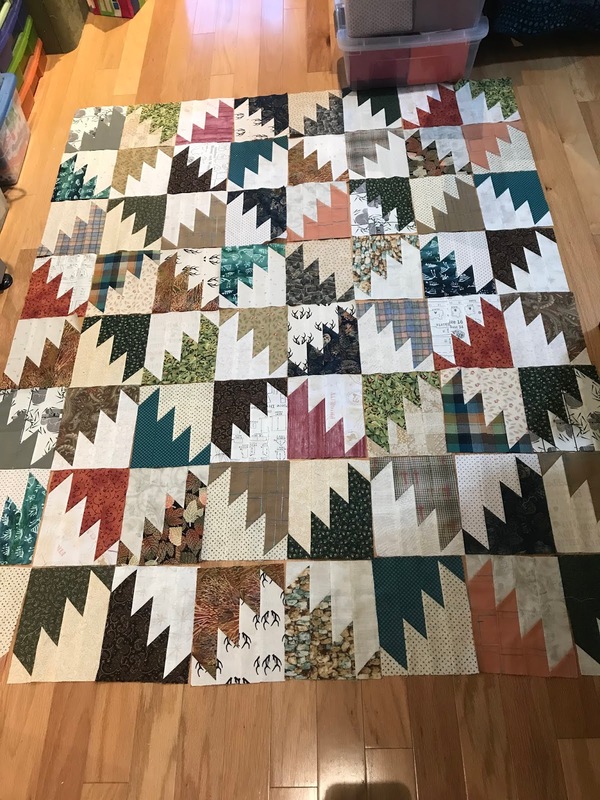 I had all of my templates and a stash of old and new retro fabrics, but never managed to get my blocks sewn. This year Cheryll is using the same pattern for another SAL. I dug out my fabrics and templates and then managed to get the first block sewn. On the gardening side of life, January means rose pruning here. Although it cuts into sewing time, it is a great feeling to get them finished. It won't be long before they are blooming again. 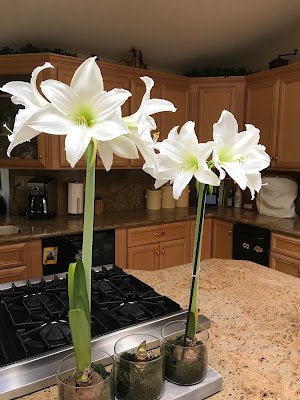 Inside, the amaryllis sent up a second bloom of four more flowers. To close I will leave a picture of what happens around here when one leaves a quilt on the floor while auditioning borders. I think I need a design wall! 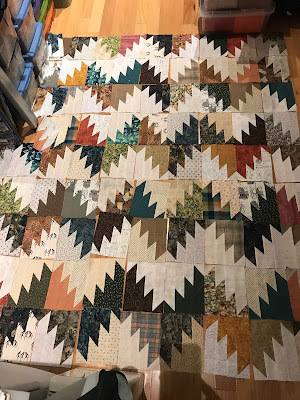 I love the change of color in your mystery quilt - looks like sunflowers in a field. 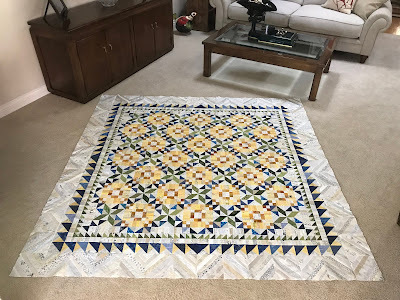 I have never made the mountain pattern - taught it with mock up blocks, but never made a full quilt. Must do that to use up my wovens and plaids. Your extra border on Good Fortune is very nice. Gorgeous dog, too. I also would like to know why our stashes don't look smaller when we make these large quilts? The scrappy mountain blocks look good in either arrangement. 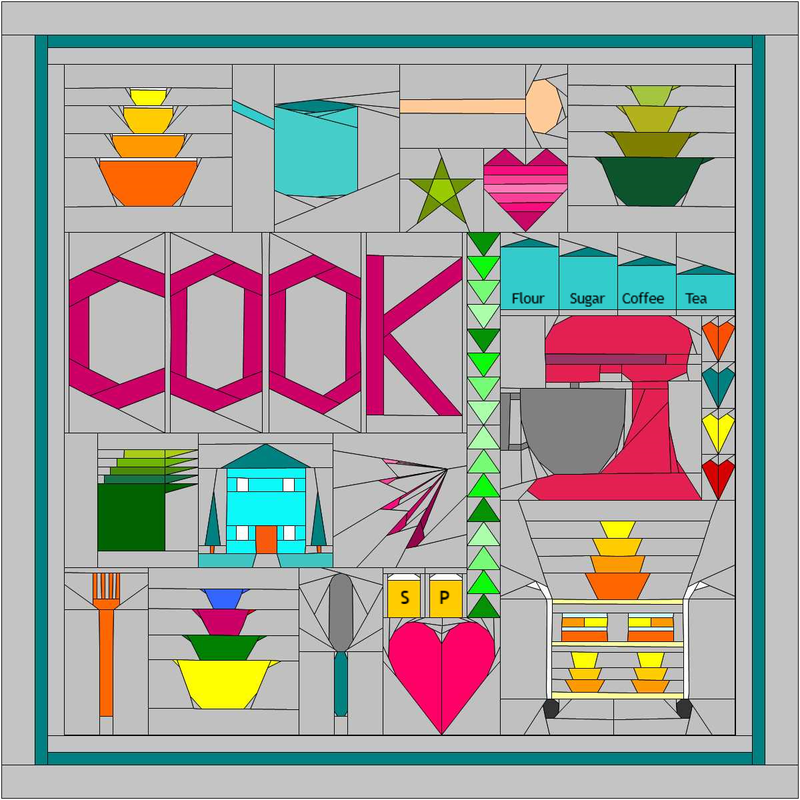 I haven't made that block - but I'm not about to start another project right at the moment! Lovely to see your Bloom block! And it is a reminder to me to get sewing on the second block for the next link-up on Saturday. I also love your amaryllis/hippeastrum. Such amazing flowers! Indeed what are an extra fifty two extra paper pieced strip blocks when they finish your quilt perfectly. This quilt is amazing, Mary. I rather love the second arrangement of the Scrappy Mountain blocks, too, though the first one looks great. 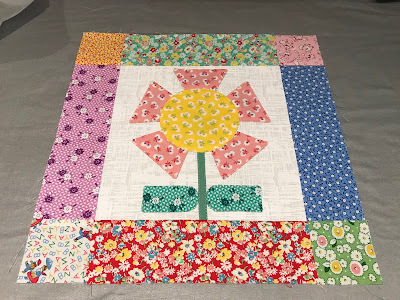 LOVE your scrappy retro fabric flower blocks...be still my beating heart! Do you know I recognise some of those fabrics sitting in my stash....what a small world it is. =) Beautiful white Amaryllis....I sense a whiff of Spring arriving to your shores. I like your motto for this year...out with the old. We quilters can get so distracted by the new and shiny fabrics and patterns and leave our old plans forgotten in cabinets, etc. Your second layout for Scrappy Mountain is so striking! And you can't go wrong with Lori Holt designs. Enjoy your creating! Your subtle border on Good Fortune is a gorgeous variation on Bonnie's mystery, one that makes your center really shine. Love it! I like both layouts for your scrappy mountains, reminding me there's a stack of those blocks just waiting a decision on layout. I may need to try your first layout with them, that is such an interesting and different layout it just might work - thanks for the hint! I agree, Mary, that subtle border is wonderful! It adds a bit of mystery itself. The mountain quilt is quite lovely too..great scrappy colours. Good for you trying to get some of the older things finished. I'm doing some of the same with older tops that were never finished and older fabrics that were never used. I also have the same problem with my cat and quilts on the floor. The added border on your mystery quilt works really well. Nicely done. I LOVE that border on your mystery quilt and your coloration of it is so nice too. My Amaryllis have the last flowers starting to bloom now too. I'm going to miss them when they are gone. 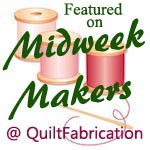 Oh I was soooo tempted by Cheryll's sew along but I am really trying to finish up some UFOs this year and keep some (ahem...temperature quilt) from becoming UFOs. I love your Good Fortune. Those colors are so comforting and the string border is fabulous. Your quilt model is very handsome, too! Your quilt is so pretty. I love the extra border that you added. I definitely prefer the second Scrappy Mountain layout. It is wonderful that you are now joining that stitch-along and got that pretty flower stitched. There is always something new to start, isn't there? As I have mentioned...I adore your Bonnie mystery quilt!! Your quilt is gorgeous! I love your color choices. And your helper is just adorable!! 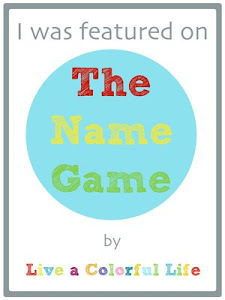 This was a super cute post and a fun read. First off, I love what you have done with your Good Fortune border. The cream colored log cabin blocks are PERFECT! Second, I really preferred the second layout, which you chose, for your mountain blocks. This one is going to be so pretty, so I am glad you are sticking it out and finishing it. Mom gave us girls an Amaryllis for Christmas. Mine blooms red. I am patiently awaiting 3 more blooms to open up. I keep wondering how long it will keep blooming. I like how you always capture the Zeitgeist in your posts--the idea of resisting new quilts, while trying to finish up the old ones. I'm somewhere in between those two ideas, having started a Temperature Quilt (it's all your fault). I love love that Quiltville quilt. 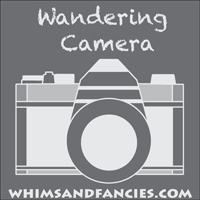 Adding those last two borders really helps it breathe a little, and balances the composition. It seemed a bit scrunched in in the original design, so you've quite improved it (to my way of thinking). I also like your mountains quilt (but like another reader, I like the first arrangement quite well, too). Fun to see your amaryllis blooming! Love your change to Bonnies mystery. And the mountain version of the scrappy one is on my bucket list. Good on you getting an old project together too. 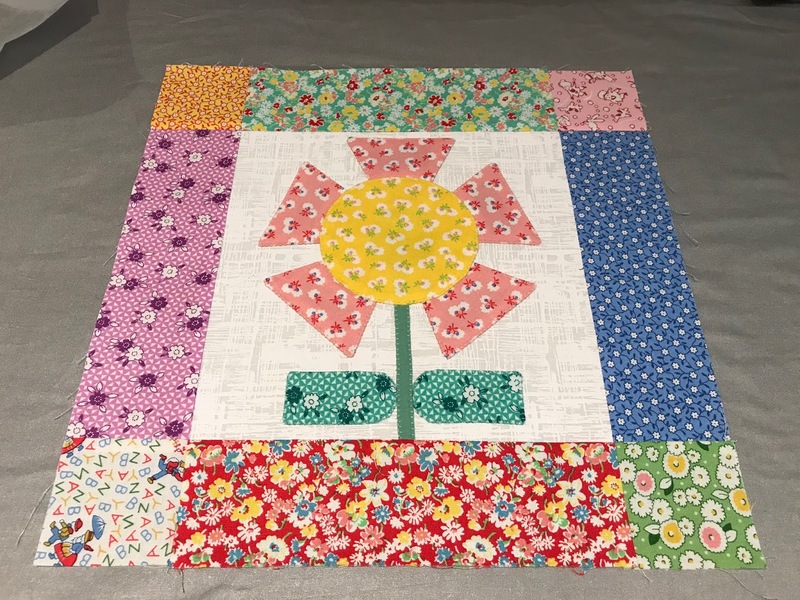 Your Bloom Block is pretty and nice that you have joined in with Cheryll to get the quilt made. Cute photo of your fur baby. Lovely quilts Mary. You have been busy. I love how our pets home in on a new quilt. I dare hardly leave any wip around, but the cat has to test it for comfort. Beautiful Amarylis. 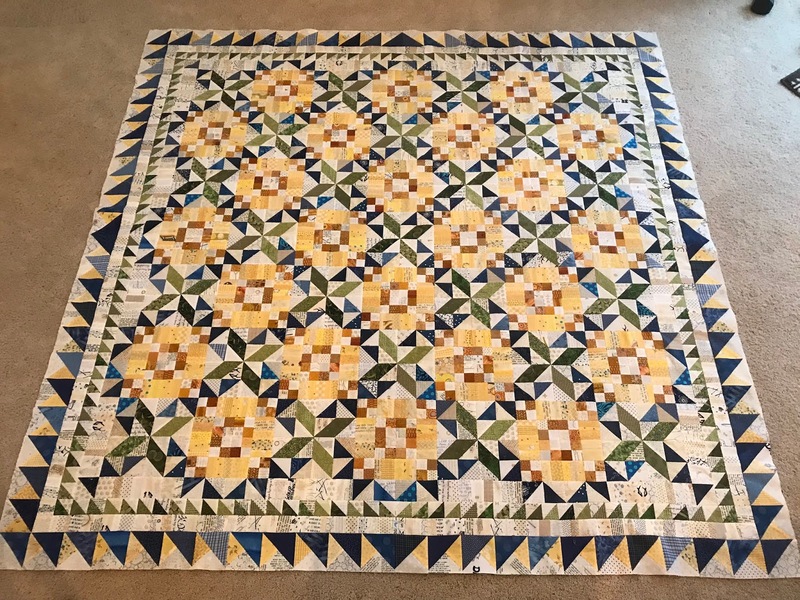 Adding that extra border really made it a very striking quilt! Your flowers are beautiful, I envy your weather that you can start pruning your roses. Your UFO's look way more beautiful than any I have sitting around. 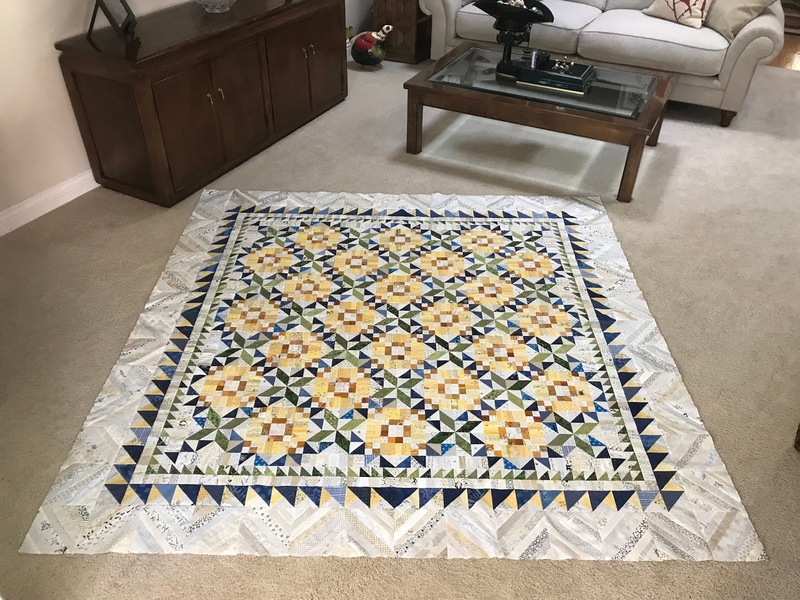 I love the paper pieced border on that quilt...gorgeous! Such a sweet baby looking comfy on the quilt. Great addition with the strip border. Aren't mountain blocks fun to play with? I like both arrangements. 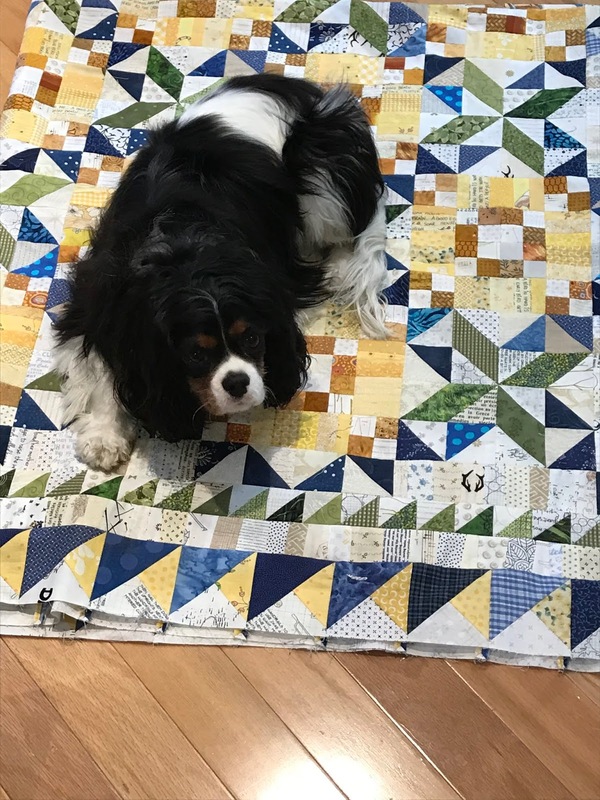 Oh my gosh, I think I slobbered all over myself with your post...that first quilt is just fabulous and love the other ones you are working on. 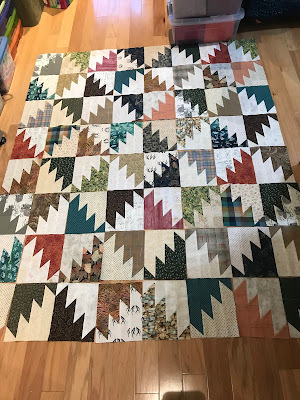 Your mystery quilt turned out beautiful! Love the colors and the border is amazing!